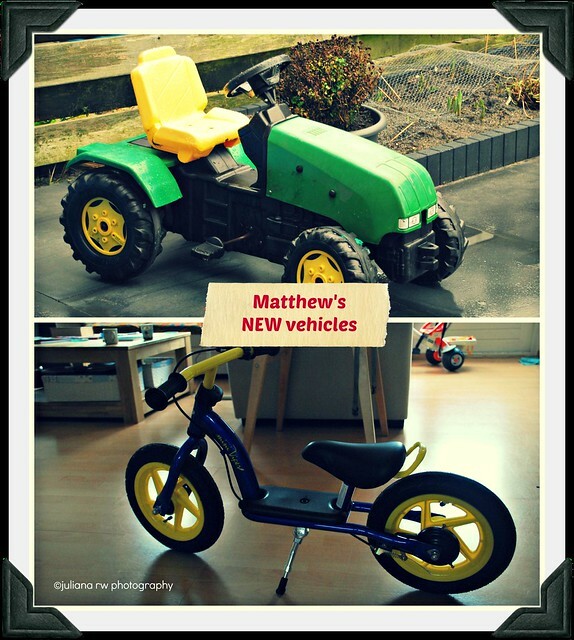 Two weeks ago, we got a second hand tractor for Matthew from a Jason's classmates. He didn't use it anymore and they are going to move to different city, so... they don't plan to bring it with them. We were so happy for Matthew. It is not new, the wheel was little bit damage but it can ride well. At this moment, Matthew can not ride it yet. I also bought a new walk bike for him. I tried to find a second hand but I can't find it. This one it is new, I bought it because it was on sale. I am sure he can use it. Yesterday, Matthew was practice it and he is getting better. He can use it to go to school when he is good enough to ride it.